What should I do with a blank wall in my office? Those of you that follow me on Pinterest may have seen my board “Blank wall in my office.” I’ve been collecting inspiration for, you guessed it, a blank wall in my office. I know I could fill it with framed artwork, but I also want to make it functional. I find it useful to post designs-in-progress, so that’s one of my goals for the blank wall. What would you do/have you done with a blank wall in your office? If you have a related board on Pinterest, share your link! Latte cups, Hello Kitty candy...and magazines! Yesterday, I went to Anthropologie on Southport Ave. in Lakeview in search of a magazine (Anthology). I ended up leaving with issues of Anthology and Uppercase Magazine (my two new favorite magazines, thank you)—plus a whole bunch of creative inspiration. After inevitably trying on clothes, I found myself browsing—and becoming inspired by—the books, magazines and other lovely finds scattered throughout the store. Nomad: A Global Approach to Interior Style by Sibella Court and Chris Court: I love collecting items on my travels… and hey, I just heard Sibella on Grace Bonney’s After the Jump! The aforementioned Anthology and Uppercase: two lovely and wonderfully-designed print magazines. Yes, I said print. Anyone else find creative inspiration in retail spaces? I recently got kicked out of my home office. By my infant son, that is. Little One needed a room of his own, so I had to look for a new workspace. After working from home for 11+ years, renting an office had been a goal, so it was the perfect opportunity. After I moved in, I worked with my good friend, professional organizer Elizabeth Lulu Miranda of Mercury Organizing Solutions to create organizing solutions for my office. She suggested filing away office supplies and paperwork not needed on a daily basis and keeping inspirational items (books, magazines, artwork) out in the open. See my bookshelf filled with creative goodies above. Stay tuned for a blog post elaborating on the organizing solutions! Are you considering renting a workspace outside the home? Read my post on the Creative Freelancer Blog about making the jump to an office. Why should kids be the only ones who get a chance to peek into Mom & Dad’s workplace? Mark your calendars: Friday, June 24 is Take Your Dog to Work Day! In my case, I’m lucky to have Essie in the office regularly. Essie is a great office-mate. She doesn’t complain much. She’s a great stress-reliever and walking partner. Plus, I don’t even have to pay her (well, maybe in kibble). She also keeps me from hunching over my keyboard for hours on end. How can you resist a furry paw on your arm, begging you to go out? Now if only I could train her to fetch me a cup of coffee. See Essie “hard at work” in the Take Your Dog to Work Day Photo Gallery. Are you planning to take your dog to the office on Take Your Dog to Work Day? Does your dog work with you full-time? Share in the comments! Read my latest post on the Creative Freelancer Blog for tips for staying healthy at your desk. 2011 calendars added to our online shop! Fresh new colors for 2011! 2011 Quick Peek Calendars are now available in our business greetings online shop. Small enough to fit in a laptop bag or on an office wall, but large enough to see a year at-a-glance. Great for planning vacations. Buy a couple and share with your office mates. NEW for 2011: color palettes inspired by Pantone 2011 color trends, including one of my personal favorites: turquoise and terracotta. Free shipping via first-class mail on Quick Peek Calendars! Follow the Greetings by Lidia Varesco Design RSS feed or twitter page to see the latest designs. While I’ve recently kicked my outdoor urban gardening into high gear, I’ve always had lots of houseplants in my home and office. I recall my mom telling me long ago that plants clean the air—and by gosh, she was right. Whether we realize it or not, our offices can harbor loads of air pollutants and irritants, such as laser toner dust, carpeting and dry cleaning chemical residue, and recirculated air. But our houseplant friends are here to save the day, helping to remove common air toxins—all while making your workspace more cheerful and inviting. But don’t just take my (and my mom’s) word for it, read about a study from NASA on how houseplants help clean indoor air. Then go out and hit your local nursery. Most of these plants are easy to grow in an office, with some needing little or no light (great for a windowless cubicle). Read how to choose and care for houseplants. 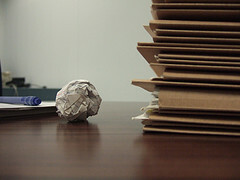 When people used to think of recycled papers, they envisioned a brown paper bag or worse yet, a dirty white flimsy sheet. Well, welcome to the new world of recycled papers! …the number of leading environmental printing and writing grade papers produced in North America has more than doubled from 97 to 228 in the past 18 months (according to information released today by Canopy, a Vancouver based non-profit organization that works to improve the environmental performance of paper and wood companies, and a Steering Committee member of Environmental Paper Network.) The sharp increase in eco-paper options is the result of large paper buyers demanding more papers with ecological attributes, a growing trend despite recent troubles in the North American paper industry and global economy. As I’ve been transitioning my line of greeting cards and stationery to 100% PCW recycled paper, I’ve done exhaustive research in this area. I’ve compiled a list of what I consider the best and brightest (literally!) recycled papers easily found in the marketplace now. Many are available in colors, in addition to white and off-white. And many are surprisingly affordable. So now there’s no reason not to think green when choosing paper for your business needs. Where can I buy them? recycled paper can be purchased in small quantities from online paper retailers such as The Paper Mill Store, which has a handy page showing all 100% recycled papers at-a-glance. You may also order directly from the paper mills—follow the links above for ordering info. Let your clients or customers know! If you’re using 100% PCW recycled paper to print your marketing pieces, you may want to let your customers know by printing the recycled symbol on the piece. This guide from The Paper Mill Store explains the correct way to use the various recycled symbols and provides a link to download the logos. If I have forgotten any 100% recycled paper stocks, please write a comment and I’ll add to my list. Happy (recycled) printing! 2009 is coming to a close and, in my quest for organization, I’m inspired by articles such as 10 things to Do Before the New Year (from Web Worker Daily). Personally, I always do year-end organizing for my small business— it just feels right to start off the new year at least slightly more organized than you left the last one. My current routine includes the following…. Designing my 2010 Quick Peek Calendar to send to friends and clients. How are you spending the last few days of the year? Share your ideas!